Ministers of the United Progressive Alliance government are often heard mouthing platitudes about inclusive growth. On the face of it, inclusive growth seems a democratic ideal. But platitudes aside, what does the ideal really translate into for farmers, fishworkers and tribals? It means having to face the adverse consequences of India's galloping economic growth. Finance Minister P Chidambaram put forth the government's perspective quite succinctly while concluding his speech for the Union Budget 2008-9. He said "We must produce wealth, and then divide it equitably. How can we have a welfare state without wealth?" But do such linear solutions work? Not really, going by recent experience. Consider the move to waive farmers' loans. It might help the ruling coalition secure a few seats in the coming general elections.But will loan waiver address fundamental issues related to agrarian discontent in the country? Will it quell the discontent brought about by land acquisition for special economic zones (sezs)? Small and marginal farmers undoubtedly need succour. However, the Rs 60, 000 crore loan waiver will not get anywhere close to reviving their spirit. The budget has reiterated the government's position that manufacturing and service sectors are priority and that agriculture does not have the ability to fuel the growth rate to dizzying levels. But farmers don't necessarily buy this viewpoint and there is simmering discontent. At a meeting on sezs in Delhi, a day before the budget was presented, farmers from Raigad in Orissa stated that they saw no reason to give up on farming, no matter what macro economists believed about the 'ailing' and 'dependent' agricultural sector. The agrarian crisis in the country has received media attention. Most editorials see the problem in purely economic terms and therefore have identified economic solutions. Little has been said about the ecological aspect of the problem. It's not surprising that the latest budget seems to have missed this aspect of the problem. Over the last decade, farming has become heavily dependant on external inputs. Agriculture cannot do anymore without commercial products seed, fertilizer, pesticide, tools; even water at commercial rates. Traditional cultivation of ecoregional and seasonal crop varieties like millet that need minimum irrigation and chemical inputs remain only in a few pockets. Lack of market linkages for these varieties and increasing subsidies year after year to for chemical fertilizers have not only rendered traditional farming unviable, but have impacted the fertility of farm lands to a point of no return. The consequences have been disastrous. 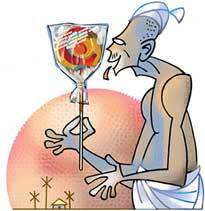 Take for example, the recent cases of farmer suicides in Orissa. The farmers, who took their own lives, grew cash crops that required high investments. They were therefore unable to absorb losses from a single crop failure. Big irrigation projects, touted as the silver bullet of all agricultural problems have not helped much. Several flagship irrigation projects, including the infamous Sardar Sarovar project (ssp), have caused permanent damage due to intense water logging in the command areas. The current budget gives irrigation a major investment boost, and allocates an initial capital of Rs 100 crore for setting an Irrigation and Water Resources Finance Corporation. Under the Accelerated Irrigation Benefit Programme, which has an increased outlay of Rs 20,000 crore in 2008-2009, 24 major and medium irrigation projects and 753 minor irrigation schemes are to be completed in coming year. The list includes the ssp and Thoubal dam in Manipur. It's another matter that the Mapithel Dam Affected Villages Organization in Manipur recently asked for a comprehensive review of the Thoubal project. Their complaint is that the project was cleared in 1980 without proper environmental, economic and safety studies. Price instability, market fluctuations and entry of big businesses into agro-industry have created a medusa. We need a radical policy shift to address the causes of agricultural debt. Else, our supposedly inclusive growth will continue to ride on backs of poor farmers.